I like to play a parlor game with music loving friends. We all lament great musicians who died young--like Jimi Hendrix, Wes Montgomery, Janis Joplin, Hank Williams, etc.--and wonder what might they have accomplished had they lived. But, I say, try to name an artist whose brilliance was recognized young, who lived to middle or old age and continued, or if still alive continues, to create on an equal or improved level. Bob Dylan and Neil Young are often mentioned--yet in the Scorsese doc even Dylan admitted that he can't write like he used to; and recent work by Young, though good, is hardly on a par with After The Gold Rush, or Everybody Knows This Is Nowhere. On the up side, though not quite on the same iconographic level, I often posit Eric Andersen, who is writing tunes today that are equal to or better than his classic work of the Sixties. The list is always surprisingly short at best, but one name that has become my trump card is that of jazz guitarist Jim Hall. Brilliant and influential as his playing has been ever since his work with Sonny Rollins and Jimmy Giuffre in the Fifties, at 75 Hall not only shows no sign of slowing down, but in the last ten years has generated new compositions, recorded output, and new collaborations, at a rate that would tire a twenty-something. Not merely a question of quantity, the quiet guitarist continues to grow as a player and a musician. Age may have slowed him a bit physically but his talent was never about dexterity or speed. It is about the embodiment of what great improvisation should always be and too rarely is: instant composition. For years the man who influenced the likes of Pat Metheny, John Scofield, Bill Frisell, and John Abercrombie, played largely a limited repertoire of standards and originals over and over, constantly finding new depths in the same music. As part of his musical evolution, he was open to discovering effects pedals at an age when many people retire, and more recently has joined a new generation in embracing the Internet to distribute his records. Upon signing with Telarc a decade ago, he began a spurt of recording duets with some of his musical progeny--bass players, pianists and horn players as well as guitarists--and churning out new material. Free Association offers five Hall tunes that reflect his composition studies as a youth in Cleveland, as much as his less formal study of the art of Charlie Christian. His affair with his harmonizer pedal allows him to create impossible-to-finger intervals in "End the Beguine" that recall the sonorities of Twentieth century classical music. 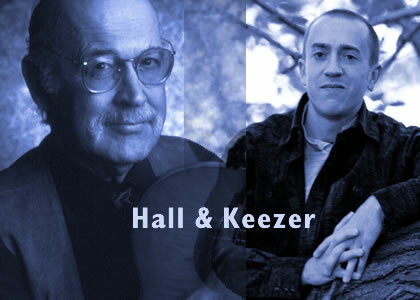 Hall's partner for this duo outing, pianist Geoffrey Keezer, complements him in every aspect, from the angularity of the aforementioned opener to the romanticism of Ryuichi Sakamoto's "Bibo No Aozoa." As on his legendary duet recordings with pianist Bill Evans, these musical conversations are so intimate that bass and drums would be an intrusion. Though comparisons with the Evans records loom in the background, this is no nostalgic attempt to recreate that particular magic. For one thing, the original duo never attempted free improvisation on those discs. Here, the title tune and "Counter Transference" prove that group improv need not automatically equal atonal thrashing. While Hall is unafraid of the occasional noise or dissonance, the latter spontaneous jam recalls Satie more than loft jazz.